Spin up a delicious and easy salad with the new OXO Good Grips Little Herb and Salad Spinner. Perfect for cleaning the leaves of those 'Living Salads' you can buy these days. Or of course, if you grow your own then that's even better! I'm not a huge fan of the pre-packed salads you see in supermarkets. Why? Because they have their shelf-life extended using 'modified atmosphere' packaging, which creates a balance of gases inside the bag to retain moisture and prevent browning. Research has shown that a manufacturing technique used to keep the greens crispy for longer also destroys vitamins and protective anti-oxidants. So with that said, much better to buy an OXO Good Grips Salad Spinner and wash your own leaves! This newly designed 'Little Herb and Salad Spinner' from OXO Good Grips is excellent and serves as an attractive salad serving bowl too. One-handed operation, the non-slip ring on the base sticks to your worktop whilst spinning salad in next to no time. At the press of a button, the brake mechanism stops the spinning immediately. The flat lid makes storage more convenient and comes apart for cleaning at the press of a button. I love the shape of the bowl which has a wide base and a flat top. There's a non-slip ring on the base which makes it stable even when spinning at top speed! The flat top of the spinner makes storage convenient in either the refrigerator or cupboard. This spinner is available with a green or clear basket. Personally I like the clear basket - don't you think it looks good? 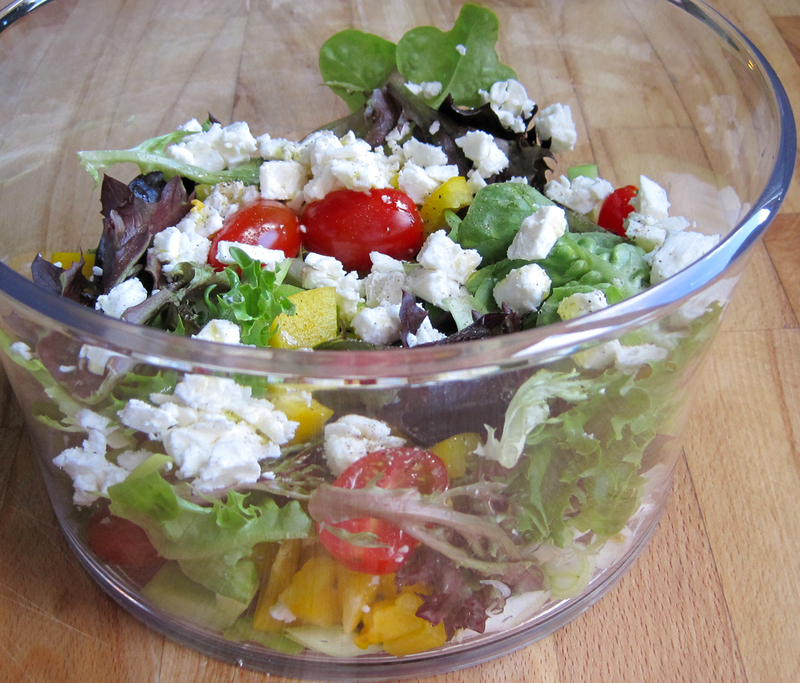 The clear bowl is perfect for serving too. Top-rack dishwasher safe Made from BPA-free plastic. So simple there isn't a recipe! 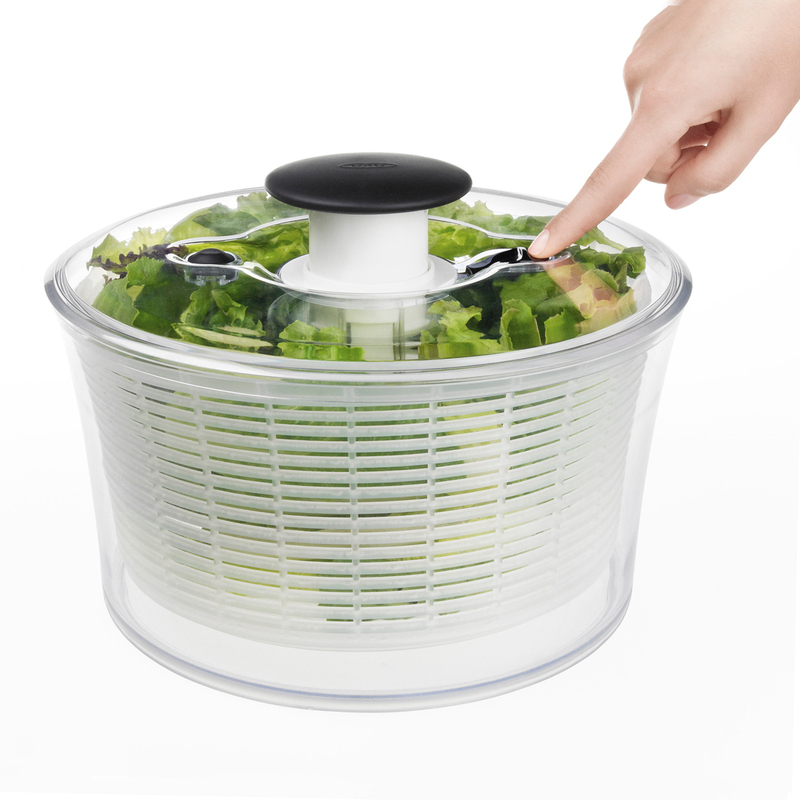 Just wash and spin some salad leaves of your choice in your OXO Good Grips Salad Spinner. 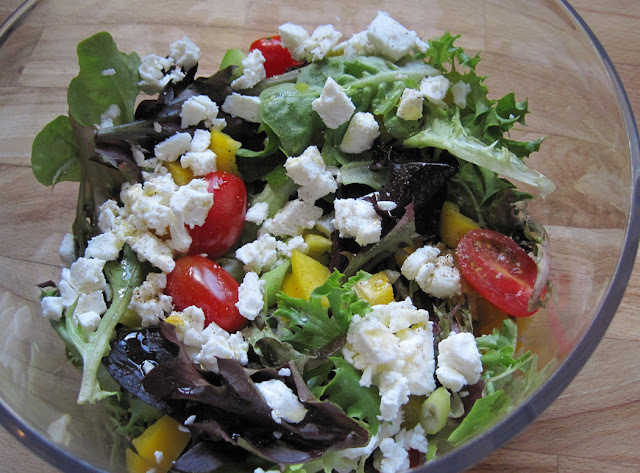 Add halved baby plum tomatoes, diced bell pepper, sliced spring onion (if you fancy it) and crumble over some feta cheese. Season and dress with your favorite dressing - job done. Thank you to OXO and Cherelle for sending me this to review. All opinions and thoughts are my own. I was not required to write a positive review. I only ever post reviews on products I like the look of, and therefore would buy myself.